First completely successful space walk. Final Gemini flight. Docked and redocked with Agena, demonstrating various Apollo scenarios including manual rendezvous and docking. Successful EVA without overloading suit by use of suitable restraints. Launched: 1966-11-11. Returned: 1966-11-15. Number crew: 2 . Duration: 3.94 days. Location: NASA Goddard Space Flight Center, Greenbelt, MD. The final curtain snagged twice before it opened on Gemini XII. Spare parts became a problem, as had long been feared. An autopilot and a rate gyroscope in the launch vehicle had to be replaced. Then, the replacements were themselves replaced. But, on Veterans' Day - 11 November - Flight Director Glynn Lunney signaled for the overture to begin. At 2:08 p.m. the substitute Atlas lifted the refurbished Agena from pad 14 and lofted it into orbit. A few minutes earlier, over on pad 19, the pressure-suited crew had shuffled up a ramp, bearing signs on their backs - "THE" and "END." This bit of humor was more than symbolism, for when launch vehicle No. 12 broke its landlock 30 seconds after 3:46 p.m., the Gemini preparations team faded into space history. Francis Carey, Martin's chief test conductor, and Colonel John Albert, Chief of the Gemini Launch Vehicle Division, 6555th Aerospace Test Wing, took justifiable pride in the 12 for 12 record, but they mourned the fact that the job had ended and the team would soon break up. That it was over could hardly have been more vividly underlined - almost at once wreckers were hacking the launch stand into scrap iron. Apollo was the future. A harbinger of this new era, Lunar Orbiter II, had been launched only five days earlier 6 November in a trip to the Moon to photograph possible Apollo landing sites. Meanwhile, Lovell and Aldrin began to wonder if everybody had gone away too soon. For 25 minutes, with one brief exception, they heard nothing from the ground. The Ascension Island tracking station had the wrong acquisition time, so its communicators had not talked with the pilots. Lovell was relieved when he heard Conrad hailing him through the remote line at Tananarive with some needed data for a maneuver that was scheduled to take place within a few minutes. Things now went smoothly and a little more than an hour after launch, Aldrin reported, "Be advised we have a solid lockon . . . 235.52 (nautical) miles (436.18 kilometers)." From Houston, Conrad replied, "It looks like the radar meets the specs." When the spacecraft moved into a circular orbit below and behind its target, the radar showed the Agena to be 120 kilometers away. But this was the last figure the crew could trust; reception got so poor that the onboard computer refused to accept the radar's intermittent readings. The radar failure meant that Gemini XII would have to rely on the backup charts it carried to complete the rendezvous. Aldrin, a member of the team that had planned and worked out chart procedures, now had a chance to see if his doctoral studies at MIT and the simulator training in St. Louis with McDonnell and MSC engineers really were practical in space. The pilot, who was sometimes called "Dr. Rendezvous," had already pulled out and used the T-2 manual navigation sighting sextant to take a look at the target. When the radar went on the blink, this piece of experimental gear became operationally important. In the automatic rendezvous mode, the radar would have fed range and range rates to the computer. Lovell would then have flown the spacecraft by the resulting numbers. This time the computer would be left in the catchup mode, and either Aldrin or Mission Control - or both - had to figure range and range rates to see if the computer was correct. For this backup method, Aldrin used the sextant to measure the angle between the local horizontal of the spacecraft and that of the Agena, ahead of and above them. He checked this information with his rendezvous chart and cranked the necessary corrections into the computer. Lovell flew the spacecraft with these numbers to rendezvous with the target, arriving there after 3 hours and 45 minutes of flight. They had used only 127 kilograms of fuel. Lovell called the Coastal Sentry Quebec at 4:13 hours elapsed time, saying, "We are docked." But Gemini XII was the fourth flight to make that announcement, and the shipboard flight controller merely replied, "Roger." For the second time, a Gemini crew was able to practice docking and undocking. They unlatched the vehicles and Lovell tried the task during the night. But the spacecraft was misaligned; the target's docking cone did not unlatch. Instead, it locked bumpers, catching on one of the three latches. Much like an automobile driver mired in the mud, Lovell fired the aft and forward thrusters, trying to rock the spacecraft free. Both vehicles were shaken, but he broke loose without damage to either. A few minutes later, Aldrin docked without difficulty. Even after the eclipse became a flight-plan casualty, planners continued to plot its path. Now there was a chance to work this experiment back into the mission. The Agena's secondary propulsion system had enough power to get the spacecraft into position for an eight-second photographic pass at the proper time. Schneider and Lunney agreed that this piece of realtime planning would give an added fillip to the mission. Nevertheless, at 7:05 hours after launch, Jim Lovell fired the Agena's smaller engines to slow his speed 13 meters per second. Agena still had its doubters - Conrad had told them, "If It gets away from . . . take it over with the (spacecraft)." But the target vehicle performed splendidly, and the crew then bedded down for the night. The Canary Island controller greeted the crew in the morning with the news that there would be a second maneuver - 5 meters forward - to line the vehicles up properly. The prospects panned out richly, and the crew reported seeing the eclipse "right on the money at 16:01:44 g.e.t." The path of the eclipse cut a swath across South America from north of Lima, Peru, nearly to the southernmost tip of Brazil. Although they thought for a moment, they were slightly off track, their aim had been accurate. He set up an ultraviolet astronomical camera. During two night passes, he photographed star fields, although Lovell had trouble turning the spacecraft in specific directions because the Agena had nearly a full load of fuel. During daylight, the pilot installed a movie camera; fixed a handrail leading to the target docking adapter cone; pulled off the ultraviolet camera, reloaded it, and put it back; retrieved a micrometeorite collection package; and took pictures. At 21:58, the crew buttoned themselves back into the spacecraft after recording their first, highly successful, 2-hour-and-20-minute exercise. Next he unpacked some small penlights and set to work in the busy box, torquing bolts and cutting metal. On one occasion, a bolt and washer slipped free. Aldrin maneuvered the weightless fittings into a comer, capturing one in each hand. Lovell asked him over the intercom if he was playing orbital mechanics in the adapter and the pilot replied "Yes. I had to do a little rendezvous there." At sunrise, he returned to the open hatch. 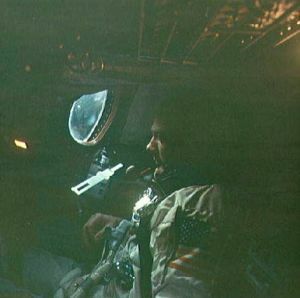 After resting for a few minutes, Aldrin again went forward to the Agena - this time to a busy box attached to the target. Lovell watched him as he pulled electrical connectors apart and put them together again. Aldrin also tried a torque wrench that had been designed for the Apollo program. For this task, he first used both waist tethers, then one, then none. 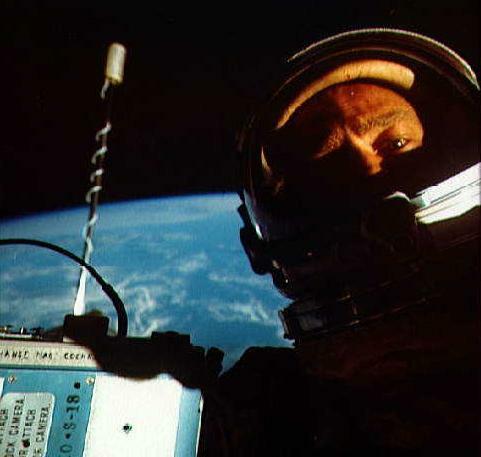 On the way back to the hatch to end his second two hours of extravehicular time, Aldrin stopped to wipe the command pilot's window with a cloth. As he did, Lovell asked, "Hey, would you change the oil, too?" The "air in the tires" was "A-OK," so Aldrin climbed aboard, stood in the hatch, and watched while Lovell fired some of the thrusters. He then sat down in the spacecraft seat. The door closed easily, and Aldrin released the oxygen in his life support system to help repressurise the cabin. The third hatch opening (and the second stand-up-in-the-seat period) came on the fourth day and lasted an hour. The pilot tossed out a lot of equipment he had used during the umbilical, as well as some empty food containers. The astronauts were not really litter bugs. Discarded items from the flights, like other things in orbit around Earth, eventually reenter and burn up in the atmosphere. Aldrin then snapped several ultraviolet photographs of constellations. That finished, he went back inside and closed the hatch; the last extravehicular performance of the Gemini program was ended. But NASA engineers, mission planners, and astronauts now believed they knew much more about the fundamentals of EVA. Between the second and third hatch openings, Lovell and Aldrin went into their tethered vehicles act. Lovell backed Gemini XII carefully away from the Agena, forming a pole vertical to Earth. The tether deployed smoothly (with only a brief hangup) but remained slack. Lovell was exasperated at his inability to tighten it, using the spacecraft thrusters. "About this time we had a little . . . problem," he said, ". . . every time I wanted to pitch up or yaw, I would roll." Despite the control problem the crew did obtain the gravity gradient they sought. Both vehicles got upset on occasion, the spacecraft at one time wigwagging about 300 degrees. What caused these disturbances, the program office stated in its formal mission report, "is not completely understood, nor is the system behavior during and immediately following these excursions." The tether exercise lasted four hours, proving that both the controllers and the crew were confident enough to continue this form of stationkeeping through the nighttime passes. The ground controllers were not sure what had happened to the water storage system's two tanks that held the crew's drinking water and (separated by a bladder) the fuel cell product water. But, in some way or another, the astronauts had lost a place in which to store from 15 to 18 kilograms of water produced by the fuel cell. So the crew had to drink more water to make more room in the tanks and to purge the system more frequently to remove gases that accumulated in the fuel cell, if they were going to complete the mission. Drinking lots of water and watching the red warning light, they nursed the fuel cell along for more than 80 hours. The flight neared its end before the batteries had to take over the electrical load. So, even in the face of problems with the radar, the Agena main engines, and the fuel cells, Gemini XII had gone very well. Most of the mission objectives were accomplished, and some data were obtained from 12 of the 15 experiments assigned to the flight. At times, considerable ingenuity had been required to get around the hardware difficulties. Compared to other flights, Gemini XII's accomplishments tended to obscure its hardware problems, of which this final mission had more than its fair share. Some troubles that forced slight changes in the flight plan actually turned into triumphs. The failure of the radar during the terminal phase of rendezvous, for example, had underscored the fact that backup techniques, using onboard charts and computations, really worked. Radar malfunction barely caused a ripple in the routine. Other troubles nagged and frustrated the crew, and some had adverse effects on operations; but here, again, they were not able to mar the impression of success. What was remembered was Aldrin's flawless performance during the well planned extravehicular periods. It landed only 4.8 kilometers from the point at which it had aimed and only 5.5 kilometers from the carrier Wasp. A helicopter deposited the triumphant astronauts on the deck of the prime recovery vessel 28 minutes after touchdown. There, on 15 November 1966, at 2:21 p.m. est., the curtain closed on the Gemini manned space flight program. "Ten times in this program of the last 20 months we have placed two men in orbit about the earth in the world's most advanced spacecraft. Ten times we have brought them home. "Today's flight was the culmination of a great team effort, stretching back to 1961, and directly involving more than 25,000 people in the National Aeronautics and Space Administration, the Department of Defense, and other Government agencies; in the universities and other research centers; and in American industry. Early in 1962, John Glenn made his historic orbital flight and America was in space. Now, nearly 5 years later, we have completed Gemini and we know that America is in space to stay." Family: Manned spaceflight. People: Aldrin, Lovell. Country: USA. Spacecraft: Gemini. Launch Sites: Cape Canaveral. Agency: NASA Houston. 1964 April 13 - . LV Family: Atlas. Launch Vehicle: Atlas SLV-3 Agena D.
Gemini Agena launch on a nonrendezvous mission proposed. - . Nation: USA. Flight: Gemini 12. Spacecraft: Gemini. 1966 August 16 - . LV Family: Atlas. Launch Vehicle: Atlas SLV-3 Agena D.
Gemini Agena target vehicle 5001 completed final acceptance testing. - . Nation: USA. Flight: Gemini 12. Spacecraft: Gemini. Analysis of test data was completed by August 24 and the vehicle was disconnected from the test complex..
1966 September 6 - . McDonnell delivered Gemini spacecraft No. 12 to Cape Kennedy. - . Nation: USA. Flight: Gemini 12. Spacecraft: Gemini. After preliminary installations were completed, the spacecraft was moved to the Merritt Island Launch Area for integrated tests with the target vehicle (September 19-20)..
1966 September 12 - . LV Family: Atlas. Launch Vehicle: Atlas SLV-3 Agena D.
Gemini Agena target vehicle 5001 was mated to target docking adapter (TDA) 7A at Cape Kennedy. - . Nation: USA. Flight: Gemini 11, Gemini 12. Spacecraft: Gemini. McDonnell had delivered TDA 7A to the Cape August 19. After functional verification tests (September 13-15), the vehicle was moved (September 19-20) to the Merritt Island Launch Area for Plan X integrated tests with spacecraft No. 12..
1966 September 16 - . 1966 September 23 - . Gemini spacecraft No. 12 was moved to complex 19 and hoisted to the top of the launch vehicle. - . Nation: USA. Flight: Gemini 12. Spacecraft: Gemini. Premate verification was completed October 3..
NASA Headquarters deleted the AMU experiment from the Gemini XII mission. - . Nation: USA. Flight: Gemini 12. Spacecraft Bus: Gemini space suits. Spacecraft: G4C AMU, Gemini. 1966 September 26 - . 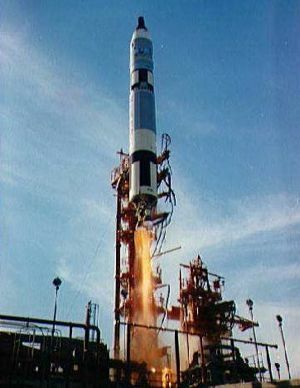 Target launch vehicle 5307 was erected at complex 14. - . Nation: USA. Flight: Gemini 12. Spacecraft: Gemini. Systems tests began the next day and lasted until October 18. The Booster Flight Acceptance Composite Test was conducted October 24..
1966 October 23 - . LV Family: Atlas. Launch Vehicle: Atlas SLV-3 Agena D.
Gemini Agena target vehicle 5001 was mated to target launch vehicle 5307 on complex 14. - . Nation: USA. Flight: Gemini 12. Spacecraft: Gemini. Joint Flight Acceptance Composite Test was completed October 28, Simultaneous Launch Demonstration on November 1.. Launch of Gemini XII postponed. - . Nation: USA. Flight: Gemini 12. Spacecraft: Gemini. The scheduled launch of Gemini XII was postponed by a malfunctioning power supply in the launch vehicle secondary autopilot, discovered before the countdown for the November 9 launch began. The secondary autopilot package and the secondary stage I rate gyro package were replaced, and the mission was rescheduled for November 10. During tests of the replacement autopilot on November 9, another malfunction occurred, which was resolved by again replacing the secondary autopilot package. The launch was rescheduled for November 11. 1966 November 11 - . 20:46 GMT - . Launch Site: Cape Canaveral. Launch Complex: Cape Canaveral LC19. LV Family: Titan. Launch Vehicle: Titan II GLV. Gemini 12 - . Call Sign: Gemini 12. Crew: Aldrin, Lovell. Backup Crew: Cernan, Cooper. Payload: Gemini SC12. Mass: 3,763 kg (8,295 lb). Nation: USA. Agency: NASA Houston. Class: Manned. Type: Manned spacecraft. Flight: Gemini 12. Spacecraft: Gemini. Duration: 3.94 days. Decay Date: 1966-11-15 . USAF Sat Cat: 2566 . COSPAR: 1966-104A. Apogee: 289 km (179 mi). Perigee: 250 km (150 mi). Inclination: 28.80 deg. Period: 89.90 min. 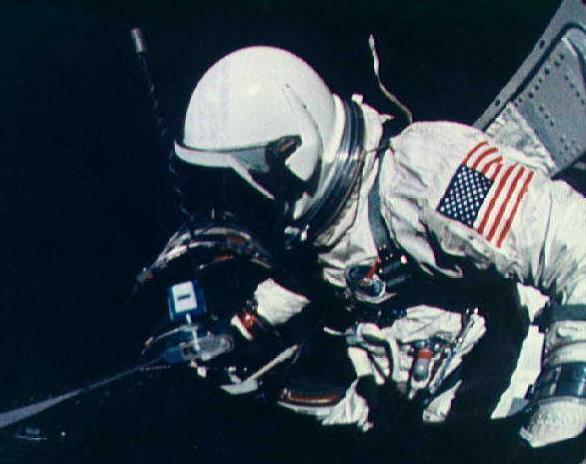 Major objectives of the mission were to rendezvous and dock and to evaluate extravehicular activities (EVA). Among the secondary objectives were tethered vehicle evaluation, experiments, third revolution rendezvous and docking, automatic reentry demonstration, docked maneuvering for a high-apogee excursion, docking practice, systems tests, and Gemini Agena target vehicle (GATV) parking. 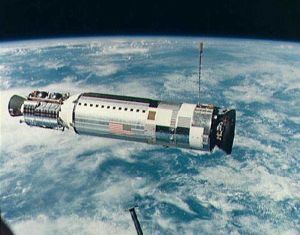 The high-apogee excursion was not attempted because an anomaly was noted in the GATV primary propulsion system during insertion, and parking was not attempted because the GATV's attitude control gas was depleted. All other objectives were achieved. Nine spacecraft maneuvers effected rendezvous with the GATV. The onboard radar malfunctioned before the terminal phase initiate maneuver, but the crew used onboard backup procedures to calculate the maneuvers. Rendezvous was achieved at 3 hours 46 minutes ground elapsed time, docking 28 minutes later. Two phasing maneuvers, using the GATV secondary propulsion system, were accomplished, but the primary propulsion system was not used. The first of two periods of standup EVA began at 19 hours 29 minutes into the flight and lasted for 2 hours 29 minutes. During a more than two-hour umbilical EVA which began at 42 hours 48 minutes, Aldrin attached a 100-foot tether from the GATV to the spacecraft docking bar. He spent part of the period at the spacecraft adapter, evaluating various restraint systems and performing various basic tasks. The second standup EVA lasted 55 minutes, ending at 67 hours 1 minute ground elapsed time. The tether evaluation began at 47 hours 23 minutes after liftoff, with the crew undocking from the GATV. The tether tended to remain slack, although the crew believed that the two vehicles did slowly attain gravity-gradient stabilization. The crew jettisoned the docking bar and released the tether at 51 hours 51 minutes. Several spacecraft systems suffered problems during the flight. Two fuel cell stacks failed and had to be shut down, while two others experienced significant loss of power. At 39 hours 30 minutes ground elapsed time, the crew reported that little or no thrust was available from two orbit attitude and maneuver thrusters. 1966 November 12 - . 16:15 GMT - . EVA Gemini 12-1 - . Crew: Aldrin. EVA Duration: 0.10 days. Nation: USA. Related Persons: Aldrin. Class: Manned. Type: Manned spacecraft. Flight: Gemini 12. Spacecraft: Gemini. Stand-Up External Vehicular Activity. Photographed earth and stars..
1966 November 13 - . 15:34 GMT - . EVA Gemini 12-2 - . Crew: Aldrin. EVA Duration: 0.0896 days. Nation: USA. Related Persons: Aldrin. Class: Manned. Type: Manned spacecraft. Flight: Gemini 12. Spacecraft: Gemini. Tested tools and techniques for extravehicular activity..
1966 November 14 - . Gemini 12 - Wakeup Song: My Favorite Things - . Flight: Gemini 12. Spacecraft: Gemini. "My Favorite Things" from"The Sound of Music" sent to the crew..
1966 November 14 - . 14:52 GMT - . EVA Gemini 12-3 - . Crew: Aldrin. EVA Duration: 0.0382 days. Nation: USA. Related Persons: Aldrin. Class: Manned. Type: Manned spacecraft. Flight: Gemini 12. Spacecraft: Gemini. Stand-Up External Vehicular Activity. Photographed earth limb and stars in ultraviolet..
1966 November 15 - . Landing of Gemini 12 - . Return Crew: Aldrin, Lovell. Nation: USA. Related Persons: Aldrin, Lovell. Flight: Gemini 12. Spacecraft: Gemini. Retrofire occurred 94 hours after liftoff. Reentry was automatically controlled. The spacecraft landed at 19:20 GMT less than 5 km from the planned landing point on November 15. The crew was picked up by helicopter and deposited 28 minutes later on the deck of the prime recovery ship, the aircraft carrier Wasp. The spacecraft was recovered 67 minutes after landing.